Last week, two of my three younger sisters came for a visit- we had such a fun time laughing, playing games, and doing one of our favorite things: baking. So...I threw my "diet" out the window and we had a blast in the kitchen, baking up a storm of sweet things. 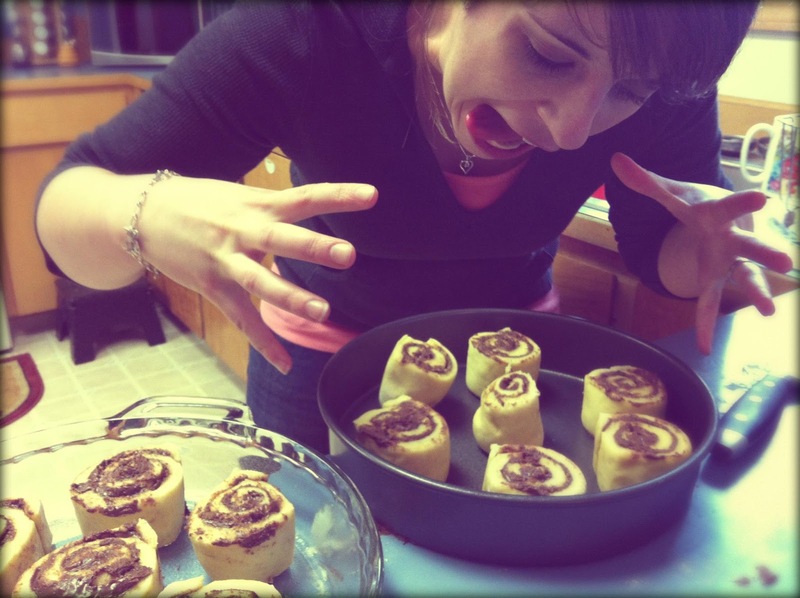 The first of those was a delectable batch of Nutella Cinnamon Rolls. I had been hankering for a pan of cinnamon rolls, needed something to take to our Ladies Bible Study, and had inadvertently picked up a container of Nutella. I first googled the idea of Nutella cinnamon rolls to see if they even existed. Of course, they did. It seems the cooks of this world have come up with any and every possible use for the irresistible hazelnut spread! (As a side note, this was my first experience with Nutella- if you have not yet enjoyed the wonder that is chocolate hazelnut spread, I invite you to do so without delay! I am hooked!) The particular blog I found this recipe on, Adventures in Food, has many of her own delicious looking Nutella creations.The rolls were much like other cinnamon rolls, a yeasty dough, rolled out and slathered with butter and sprinkled with cinnamon and sugar...but the addition of a rich layer of Nutella in the middle and a creamy Nutella-infused frosting generously drizzled on top truly transformed them into a thing of beauty. Beauty of taste anyway. Anyhow, the unusually filled cinnamon rolls were a hit with our Bible study group (and also my husband, who enjoys any departure from my "diet" which brings him baked goods)- and we girls devoured a few extra ourselves while watching "Emma" and feeling incredibly girly and indulgent. 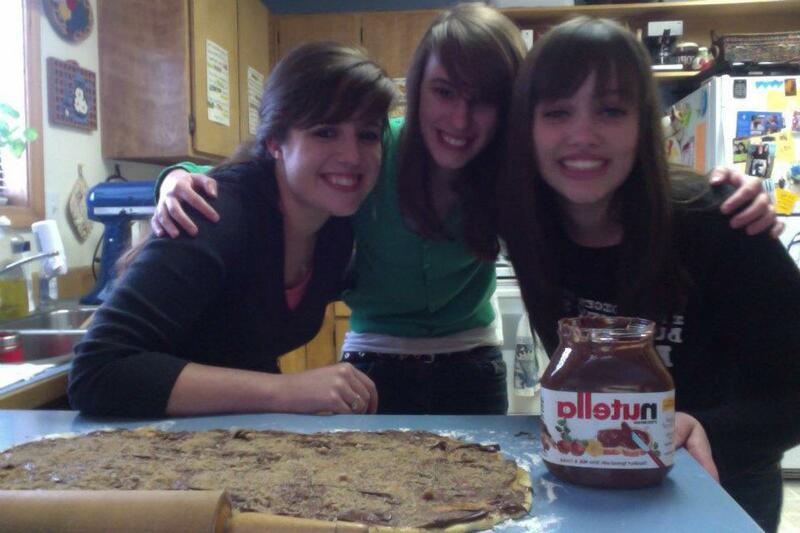 Nothing brings out the silliness like baking, a jar of Nutella, and sisters. In the bowl of your mixer, combine yeast and water, allow to rest 5 min. Add milk, butter, vanilla, salt, sugar and egg and mix well. Add 3 1/2 cups flour and mix until dough comes together, adding remaining flour a tablespoon at a time until dough forms a slightly sticky ball. Knead on a floured surface or using the dough hook of your mixer until dough is smooth and elastic. Grease a large bowl and place dough inside, turning once to coat. Cover and allow to rise in a warm place 1-2 hours. Dough is ready when doubled in size and indentations remain when you press your fingers into it. Roll dough out onto a lightly floured surface into a 9x18 in. rectangle. Brush with the 2 TB melted butter. 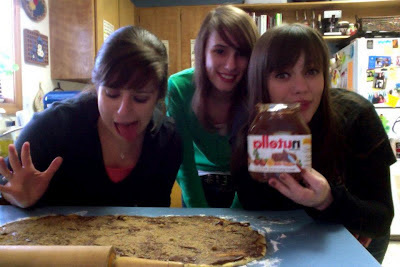 Spread Nutella evenly across the surface of the dough. Combine brown sugar and cinnamon and sprinkle over Nutella. Starting at a long side, tightly roll up the dough, pinching the ends to seal. Using a serrated knife, slice dough into 1 1/2 in. rounds. Place into two greased pie pans. Let rolls rise in pans 15 min. Bake 12 min. or until lightly browned. Allow to cool slightly while you prepare the icing. Whisk all ingredients together in a small bowl until smooth, then pour over cinnamon rolls while still warm. Oh I love Nutella! I've been enjoying it since High School! So glad you guys had a great time together. These Cinnamon Rolls look extra decadent!